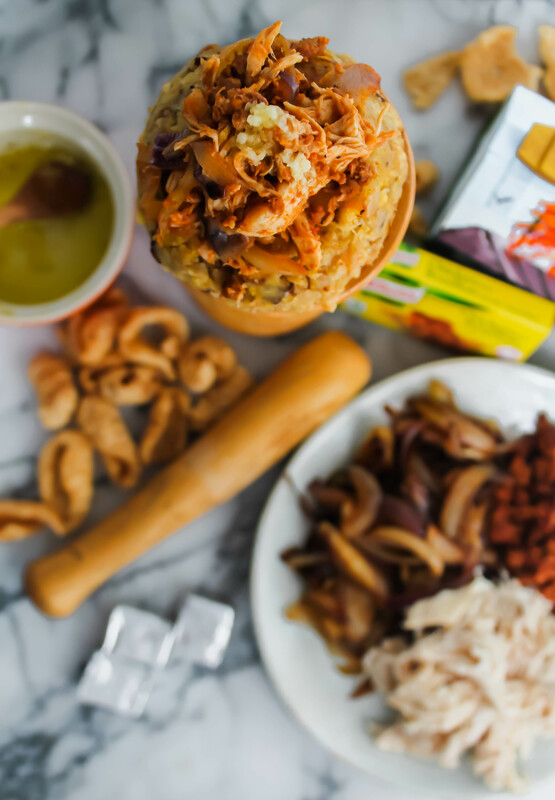 This Caramelized Onion & Chicken Chorizo Mofongo recipe is part of a sponsored collaboration with Vive Mejor and Knorr. All opinions and photos are my own. Mofongo, hands down one of my favorite Dominican dishes of all times. SO when Knorr and Vive Mejor contacted me about putting my own twist on their chicken mofongo recipe, I was excited! Today, I’m sharing a Caramelized Onion & Chicken Chorizo Mofongo recipe, with some flavorful yet healthier twists of my own. Serve up a taste of the Caribbean for dinner tonight with this lighter take on the traditional Dominican dish mofongo de pollo. But first – what is mofongo? It’s traditionally a Dominican dish of deep fried plantains that are mashed and served with some sort of protein like beef or chicken thigh stew over it. Recreating this recipe to make it healthier yet delicious, I still wanted to keep the same components yet reworked a few steps. Keep reading to find out what I did. Like I mentioned above, mofongo is traditionally double-deep fried plantains that are mashed to form a delicious dish and I knew I still wanted to fry them up somehow to get that classic texture, because if I boiled them, I’d be making more of a “mangu” than a mofongo. The answer? Shallow fry in coconut oil! In about 1/2 inch of melted coconut oil, I fried the plantain pieces until crispy and then mashed them into tostones with the bottom of a coffee mug. Mashed plantains are an iconic component of this dish, complemented typically by stewed chicken thighs in a savory broth made with onions, green pepper and Knorr Chicken Flavor Bouillon. Here’s where I stopped with tradition and instead of deep-frying again, I laid them all out on a baking sheet, sprinkled fresh garlic cloves around, and baked for about 30 minutes until both the garlic and plantain where cooked. The garlic becomes sweet and roasted, and once you mash it all together, it adds great flavor with no extra calories. I saved the calories for two ingredients: chorizo and pork rinds, which when used sparingly, add amazing flavor to this mofongo. One ingredient that isn’t packed with calories and brings in a ton of flavor as well is the Knorr® Chicken flavor Bouillon, which I used to poach the chicken in. But let’s talk more about how I made the chicken stew that’s served with this mofongo. Typically, this chicken stew is made with the fattiest part of the chicken, the thigh and cooked with oils and fats to make – quite honestly – a delicious stew. But I still made a delicious stew, just not as high in fat! First, the chicken was poached in water and Knorr® Chicken flavor Bouillon cubes dissolved in the water. This is the best way to infuse your chicken with flavor. And not just any part of the chicken – boneless, skinless breasts are the best option, as long as you don’t overcook them. Plus, poaching them adds so much moisture to the breasts, that it’s hard to overcook. For an added nutrition kick of veggies, enjoy this dish with a side salad. A brand I grew up consuming at home in the Dominican Republic, Knorr prides themselves on sourcing high quality ingredients and helping farms to implement sustainable practices such as reducing water and energy consumption, minimizing fertilizer usage, optimizing renewable resources, and increasing biodiversity. It’s great to see companies embrace environmental advances – making the world not only more delicious but better for everyone! Let me know if you try this recipe – for more deliciously Latin recipes, head on over to Vive Mejor! Serve up a taste of the Caribbean for dinner tonight with this lighter take on the traditional Dominican dish mofongo de pollo! Start by sautéing and caramelizing the onions with the olive oil - this will take about 30-45 minutes, depending on how caramelized you'd like them, so it should be the first thing you do. While the onions caramelize, heat up the coconut oil in a cast iron or sauté pan and fry the plantains in batches. Once fried, press down on each plantain piece with the bottom of a glass or coffee mug to make into a "toston". Place on baking sheet once pressed and sprinkle with garlic cloves. Bake for about 30 minutes. Poach the chicken in water with the boullion cubes. In a separate pan, cook up the chorizo. Once the chicken is poached, save the chicken stock, shred the chicken, and mix with the chorizo. Season with salt and pepper, add a cup of the stock back to the chicken and chorizo mixture and done! Now just mash the plantains and garlic that were roasted together with a masher, adding chicken stock to create a cohesive plantain mixture along with the pork rinds, season with salt and pepper, and serve alongside the chicken stew. Serve alongside a fresh salad with cilantro and you're set! 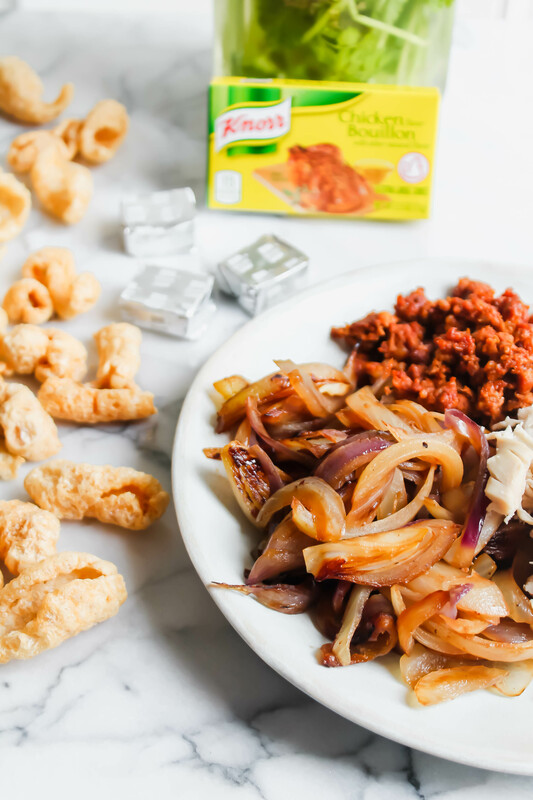 Disclaimer: This Caramelized Onion & Chicken Chorizo Mofongo recipe is part of a sponsored collaboration with Vive Mejor and Knorr. All opinions and photos are my own.